-5- SSP - The Scientific Subroutine Package (SSP) version 3 is a group of mathematical and statistical subroutines provided and maintained by IBM. 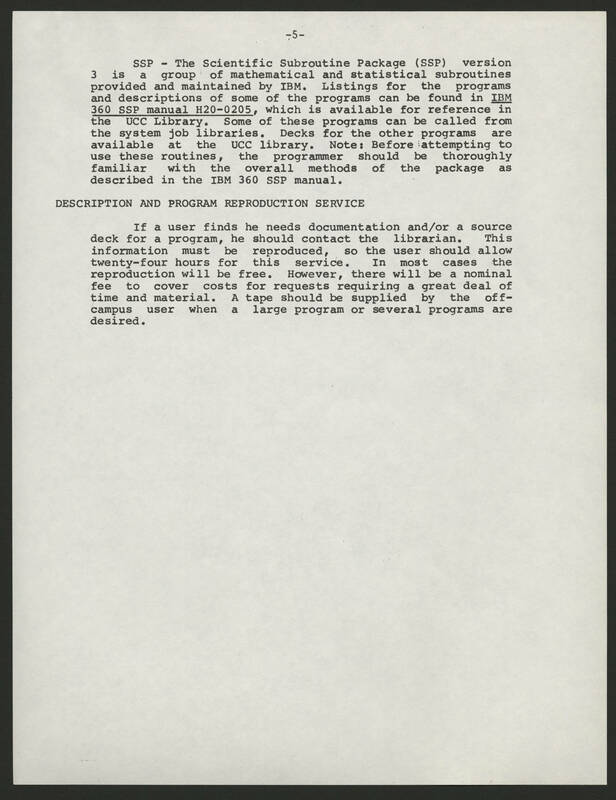 Listings for the programs and descriptions of some of the programs can be found in IBM 360 SSP manual H20-0205, which is avialble for reference in the UCC Library. Some of these programs can be called from the system job libraries. Decks for the other programs are available at the UCC library. Note: Before attempting to use these routines, the programmer should be thoroughly familiar with the overall methods of the package and described in the IBM 360 SSP manual. DESCRIPTION AND PROGRAM REPRODUCTION SERVICE If a user finds he needs documentaiton and/or a source deck for a program, he should contact the librarian. This information must be reproduced, so the user should allow twenty-four hours for this service. In most cases the reproduction will be free. However, there will be a nominal fee to cover costs for requests requiring a great deal of time and material. A tape should be supplied by the off-campus user when a large program or several programs are desired.